England one-day captain Eoin Morgan saw plenty of positives to take from the three-wicket defeat to New Zealand at the Ageas Bowl. Morgan’s side posted more than 300 for the third successive time, a sequence they have never previously achieved in one-day internationals, but they were all out for 302 in 45.2 overs. The Black Caps passed their target with six balls remaining, thanks largely to a huge third-wicket stand of 206 from Kane Williamson (118) and Ross Taylor (110), and they now lead the five-match ODI series 2-1. “I think 300 was a pretty good score, it probably wasn’t a match-winning score but I’m proud of the guys and the way they came out and played again in a positive mindset,” Morgan said. “I think for a while now we’ve always played within ourselves and always batted up before the end but for a long time we were looking like getting 350 plus and that’s exciting to see, particularly when we’re trying to change our mentality with the bat. 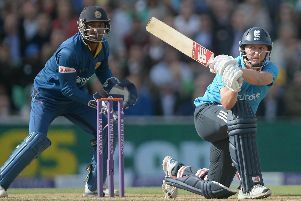 England’s new commitment to attack at all costs saw Sheffield’s Joe Root (54), Morgan (71) and Ben Stokes (68) pile in with decent scores, but losing their last five wickets for 14 runs cost the hosts. When asked if there needs to be a better balance to England’s fresh approach, especially with a view to completing their allotted overs, Morgan swatted that idea away immediately. Taylor had some luck on his side en route to his second century in three days, and Williamson was pure class - although he too was badly-dropped at mid-off on 109 by Mark Wood off David Willey on a day England would doubtless by then like to have started again.